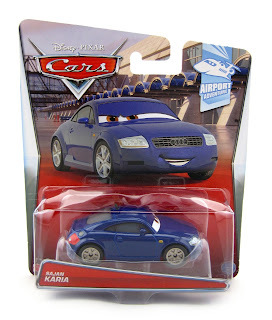 From Cars 2, here we have a brand new Mattel 1:55 scale diecast release...Sajan Karia! He is part of the 2015 "Airport Adventure" sub-series (#1/6). This is the first time this character has been made available. As shown in the screen shot above, Sajan can be seen at the Tokyo airport; but what's funny is that you never even see his face! Only his back for a brief moment. He is standing next to Acer, Grem and (the very similar) Bindo. You can find this one in stores now. If you'd rather save some time from searching around, you can always pick him up on eBay HERE or Amazon using the direct link below. Either way, good luck on the hunt!